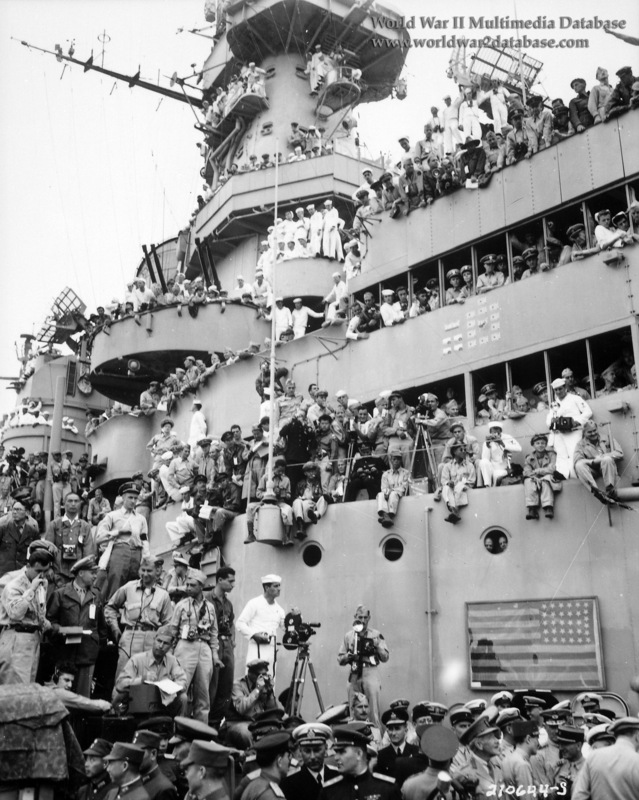 Spectators and photographers crowd USS Missouri (BB-63) superstructure to witness the formal ceremonies marking Japan's surrender, September 2, 1945. The framed flag in lower right is that hoisted by Commodore Matthew C. Perry on July 14, 1853, in Yedo (later Tokyo) Bay, on his first expedition to negotiate the opening of Japan. It had been brought from its permanent home in Memorial Hall at the United States Naval Academy for use during the surrender ceremonies. Soon after 0900 Hours, the Japanese delegates had taken their places on Missouri's veranda deck, alongside her second sixteen-inch gun turret. At 0902, US Army General Douglas MacArthur opened the ceremonies with an statement calling for "a better world...a world founded upon faith and understanding - a world dedicated to the dignity of man and the fulfillment of his most cherished wish - for freedom, tolerance, and justice."